Pencil on bristol paper, 10" x 8"
$75 plus $6 shipping in U.S.
A study for a painting I plan to do. Winslow loves the ritual of going to the studio every day, excitedly leaping into the back seat of the truck and throwing his front legs over the backrest, propped up so he can see everything. He zips up the three flights of stairs as if chasing a cat and clatters down the hallway into the main room. I don't know why the dog is so eager; the hours up there must be awfully boring for him as I get focused on my painting and forget he's even around. But whenever I do "surface" and notice him, he's always watching me, intent on studying what I might do next. I think Winslow's even more interested in me than I am. your descriptions of Winslow's habits always make me smile! and the study has inspired me to get out my charcoals and do some studies, thank you for both. Perhaps Winslow is so happy because he has a chauffeur and companion all day in HIS studio. I caught a glimpse of that in your wonderful painting,'Sun Chaser'. I agree with Rahina, your writings are endearing and complete the story beautifully. Have you thought of a book featuring your thoughts, sketches and paintings of Winslow? I love your story about Winslow! He is your devoted fan!!! Winslow is a wonderful companion! Your story is so sweet! Love your sketch and look forward to seeing the painting. Aren't dogs great studio companions? Your Winslow sketch is so very descriptive of a patient character. Love the C shape. I love Winslow stories! My dog seems to enjoy the same mindless studio routine. Though he seems to always be watching me, I'm pretty sure there's some major napping going on. There's a new pup on the alley. Same mix as Winslow and looks like a little Winslow. His name is Trout. Thanks, Rahina. 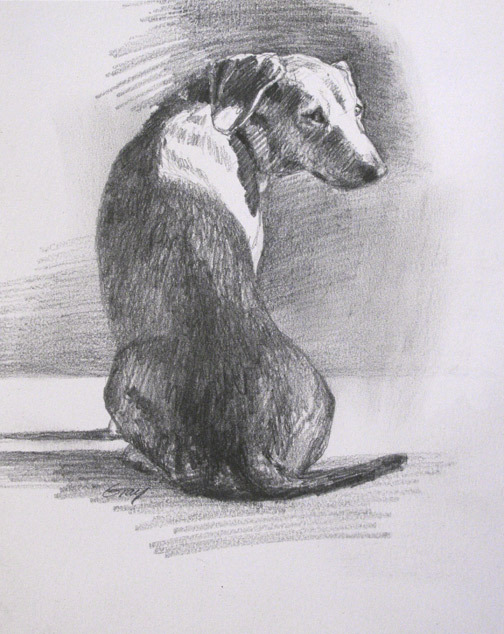 Good luck with the charcoal studies--hope to see them on your blog. Thanks for the encouraging words. I don't have enough work yet for a book on Winslow, but maybe in a few years...thanks for the idea! Thanks, Anon--yes, we're mutual fans! Thanks Silvina, so glad you're back blogging and painting. Hi Sam--yeah, I think Winslow manages to catch a few winks too. "Trout," eh? Maybe he'll show up pretty soon on SamArtDog. ??? Thanks, Jala. I like your recent cloudscapes. His body language is wonderful, especially the way his head is cocked back and the serious/submissive stare he has going on. You did a great job capturing his character in this one! Dean, I really appreciate your encouragement--thanks a lot!